Check out a highlight of our upcoming event! As Mothers we have always been there to protect our kids, but today they are the ones protecting us. Many of our Sons and Daughters are serving their Country by defending our Freedom in Iraq & Afghanistan & other areas referred to as a War Zone. As the holidays draw near, we think about traditions and comforts that we enjoy at this time. Our hope, with your help, is to send our kids with their brothers and sisters in arms a little bit of “Home” for the Holidays. 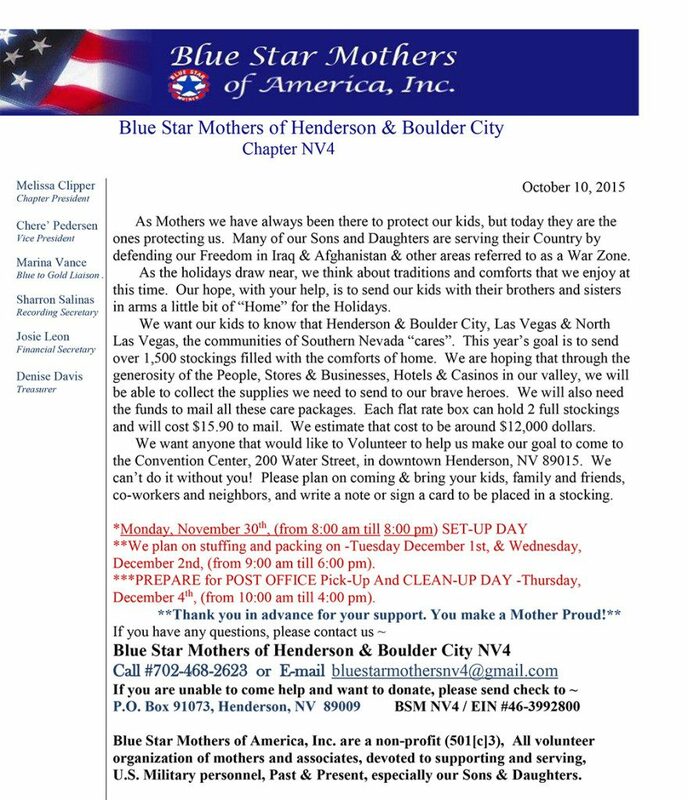 We want our kids to know that Henderson & Boulder City, Las Vegas & North Las Vegas, the communities of Southern Nevada “cares”. This year’s goal is to send over 1,500 stockings filled with the comforts of home. We are hoping that through the generosity of the People, Stores & Businesses, Hotels & Casinos in our valley, we will be able to collect the supplies we need to send to our brave heroes. We will also need the funds to mail all these care packages. Each flat rate box can hold 2 full stockings and will cost $15.90 to mail. We estimate that cost to be around $12,000 dollars. 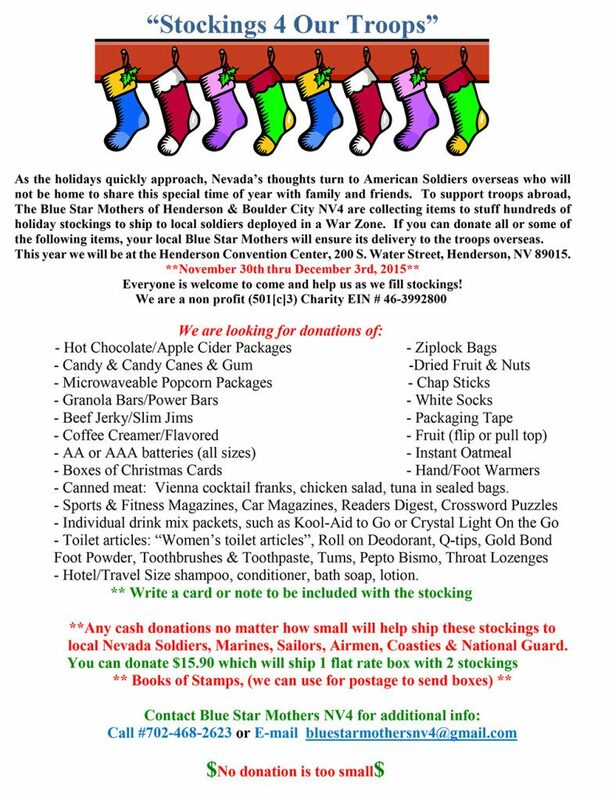 We want anyone that would like to Volunteer to help us make our goal to come to the Convention Center, 200 Water Street, in downtown Henderson, NV 89015. We can’t do it without you! Please plan on coming & bring your kids, family and friends, co-workers and neighbors, and write a note or sign a card to be placed in a stocking.